A severed head found near Egypt's border with Israel may belong to man who cooperated with Israel, security officials say. Bedouins found a severed head near Egypt's border with Israel on Friday, security officials told the Bethlehem-based Ma’an news agency. 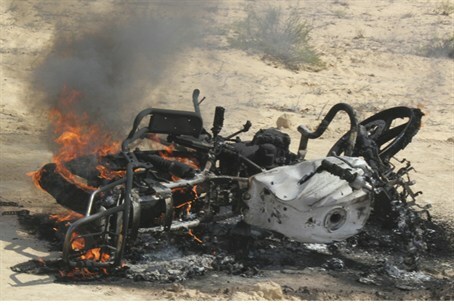 The officials indicated that jihadi groups in the Sinai were behind the murder. Security sources said the head, found near the al-Ouja crossing with Israel, most likely belonged to Mnayzel Barikat, who disappeared two days ago. The sources added that Barikat was seized by local terrorist groups who accuse him of cooperating with Israel in killing a terrorist in the Sinai Peninsula on Sunday. Two others suspected of involvement in the killing on Sunday have fled to Israel, one accompanied by his wife, residents and security officials told Ma’an. The terrorist, Ibrahim Owida Nasser Madan, was killed in an explosion while riding his motorcycle south of Al-Qasiya, 15 kilometers from the Israeli border. An intelligence report quoted by Ma’an said that Madan had just been released by Egyptian security services after he was detained a few days ago during an Egyptian security campaign in northern Sinai.